They had this rule in college that if the boys don't have a clean shaven face they would have to pay a fine. I have paid the fine many a time, because I never like to shave my beard. It was also because of the fact that someone some where created a rumor in college that the girls liked guys with beard/ rubble. I believed the rumor all through my college life. The rumor never became a reality. At work place too, I was asked by my boss to shave off my beard. But I always found a way to have a beard on my face. The Abraham Lincoln look and the French beard look always came to my rescue during those days. No one could make me shave off my beard at any point of time. The only person who has a say on my beard is my daughter Anya. 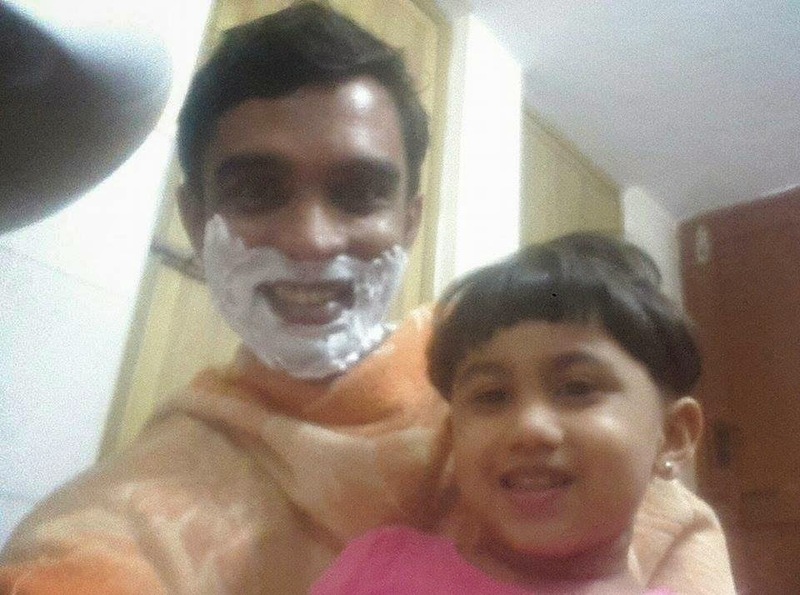 When she takes my shaving blade and hands it over to me with the words "Appa Kave pannikka pa" (Appa , Please Shave), I have no other option but to obey her. If I do not shave, she does not allow me to kiss her nor does she kisses me. This is one reason I have a cleanly shaven face all the time (these days). Ha ha ha ha!!! Jus u wait til d little darling grows up! !